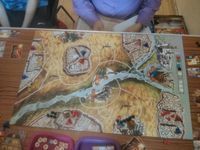 "In Kemet, players each deploy the troops of an Egyptian tribe and use the mystical powers of the gods of ancient Egypt – along with their powerful armies – to score points in glorious battles or through invasion of rich territories. A game is typically played to 8 or 10 victory points, which may be accrued through winning attacks, controlling temples, controlling fully-developed pyramids, sacrificing to the gods, and wielding particular magical powers. Detailed miniature components represent the combat units and the supernatural creatures that are summoned to enhance them. Combat is resolved through cards chosen from a diminishing six-card hand and enhanced by bonuses." " This was our second game of Suburbia at BGA. Micah hopped out to a handy lead with a fancy restaurant, but Tim stayed in touch with the waterfront realtor. Swami went the airport route, my own approach was mixed. By game end Tim claimed a tidy victory through claiming the majority of bonuses. > I like the production and the theme here a lot. The tile interactions are clever. To me, though, 4 players is too many. The tiles vanished too quickly and the luck of the draw was too pronounced. I want to play this again ASAP with three to test my theory!" "We played Suburbia only. Other table were juggle bits of wood." "On Godfrey's table, Godfrey, Tim Micah and Swami played Suburbia. On my table we played Five Points through the morning. After lunch and Swami moving to the other table we played a couple of games of Turm Bauer. The first was won by Dave when I knocked the tower over. We were joined by potential new member Philip for the second game which I won. Finally we played Love Letter, which Philip won." Peter brought food. Good to see a large turnout.